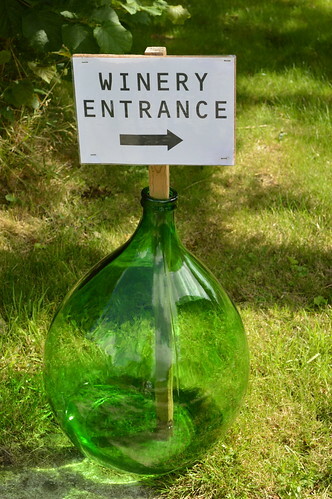 The wine Group had a very interesting trip to Bosue this week. 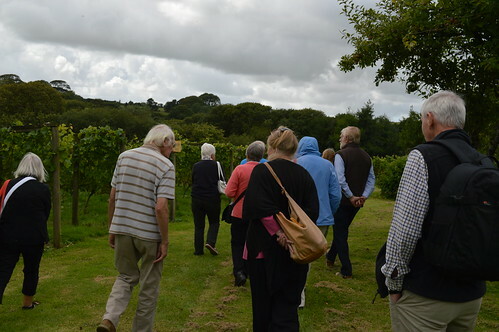 We were given a fascinating insight into the life of a small vineyard by Paul Sibley who willingly answered our many questions and gave us a tour of the vineyard and cellar. As ever we finished with a delicious tasting of Paul's sparkling, white and rose wines. Another wonderful sunny afternoon as the group sat in Helen's newly redesigned garden and sampled a couple of Riesling wines. Both wines came from Morrisons in Bodmin. Firstly we tasted a McGuigan Classic Riesling. This wine normally retails at £8-99, but is currently on offer at £5-99. The second wine sampled was Morrisons Signature Mosel Riesling, costing £6-99. "When you think of Riesling you tend to think of Germany, but this tasty tipple comes from Down Under. Yes, those fine winemakers at McGuigan have produced their own classic Riesling and packed it with flavour as only they know how. Some might think that Riesling grapes only flourish in cooler climes, but not so; the warmer Aussie weather creates a lovely dry wine, with the delicate aroma of elderflowers and a good punch of green apple and zesty lime. You really must try this wine with a fragrant Thai curry as the flavours go together perfectly. In fact, it's pretty tasty with just about anything and that makes it a really good wine to have chilling in the fridge, ready and waiting." "This classy German Riesling boasts apple and apricot flavours galore. This deliciously fruity wine's fruity taste is all wrapped up with a hint of rose petal fragrance and a crisp lemon and lime finish. Germany's cooler growing conditions are perfect for developing the characteristics of the tasty Reisling grape, which is why the country has been making some great white wines since Roman times. No surprise then that the Germans seem to have now honed the art and science of producing the perfect Mosel Reisling. The result? 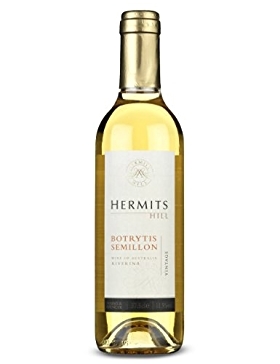 A deliciously complex tipple bursting with buckets of lemony acidity and apricot and apple flavours with a whiff of rose petal that really surprises. Serve it nice and cool and it's a great match for delicate white fish and salads." Both wines were well received by the group. Most members present could detect a hint of apple and lime in the Australian Riesling, which overall had a dry fruity taste. The group though the second German wine was very sweet and better suited as an accompaniment for a light pudding, such as a fruit salad, rather than fish as suggested by the supplier. The group were surprised by the low alcoholic content of this wine, only 8%. Overall both wines were considered to be very acceptable and ideal for drinking on a sunny afternoon whilst admiring Helen's new garden. Thanks to Helen for arranging and hosting the afternoon. I started with two wines to sample. I had bought these in France earlier this year. Both these wines were Chardonnay, and both produced by Jean-Marc and Julien Brocard. Last weekend I found another wine, from the same family, and available to buy at Sainsbury’s in Bodmin. I have not yet tried this wine. I hope we will enjoy all three. Jean-Marc Brocard trained as an agricultural engineer and then married the daughter of a wine grower from a village near Chablis. Wine making started when, for a wedding present, Jean-Marc was given a hectare of vines by his father-in-law. The family Brocard now has control of about 180 hectares of vines. Jean-Marc’s son Julien started making biodynamic wine, following the ideas put forward by Rudolf Steiner. Julien now runs most of the family business. All the vineyards of the estate are being converted to biodynamic methods. The house style has been for maturation in stainless steel as the delicate aromas of Chablis are easily masked by barrels less than 4 years old. For certain wines they might use ‘foudres’ (large oak barrels) and they are experimenting with concrete egg shaped vats. The Wine Society can supply a bottle of Jean-Marc Brocard’s Chablis Grand Cru, Les Clos 2007 for £42. I apologise for not bringing any Les Clos wine today. My only offering from Les Clos is the small rock on the table. 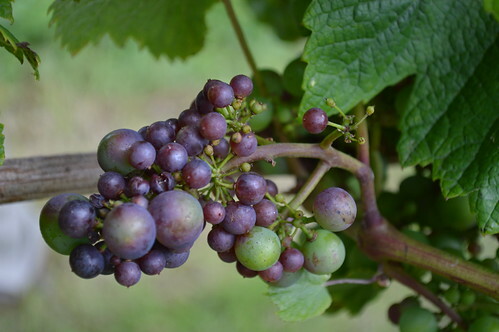 It was with the Boissonneuse grapes that Julien Brocard first developed his biodynamic methods. This is where the winemaker is guided by the phases of the moon when working the vineyards. Bought in Bodmin, at Sainsbury’s. Domaines Brocard has created this excellent wine from grapes produced in the Chablis Premier Cru vineyards of Northern Burgundy. The Chardonnay grapes reach full ripeness here and the resulting wine has the classic, floral aromas of Premier Cru Chablis with delicious citrus and mineral flavours on the finish. Served lightly chilled it tastes best with fish, poultry or goat’s cheese. Domaines Brocard is proud to guarantee the quality of this wine and recommends it be consumed within two years of purchase. Brocard’s own lists have 1st cru wines, prices ranging between £12 & £24. The first of today’s wines was created as part of a collection of three wines which also has a Portlandien and another Jurassic wine. I understand that this collection was originally brought together to illustrate the differences between the types of soil in the Chablis area. This Kimmeridgian wine is not technically a Chablis, but I believe it originates from nearby Auxerre. Geologically, the land around Chablis was laid down in the Upper Jurassic era, over 135 million years ago. The upper layers (mainly towards Auxerre) are formed from the harder Portlandien rocks (as found around Portland, Dorset) whilst the Chablis area has more of the Kimmeridgien rocks (named after the village of Kimmeridge also in Dorset). Below the Kimmeridgian there is an Oxfordian strata. Kimmeridgian deposits are made up of layers of limestone (softer than Portland stone) alternating with clay. Many fossils were laid down within these deposits. Shortly after I first visited Kimmeridge Bay, in Dorset (1958) an oil pump was installed in the area. Oil is still being pumped now in small quantities. It is the Kimmeridgian deposits under the North Sea that give us North Sea oil (and gas). I assume it is the same geological formation which is drawing the attention of the oil producers who want to ‘frac’ areas in southern England to extract oil and gas! In France fracking is illegal! Alan had chosen Chardonnay as our theme this week. The first wine a classic French use of Chardonnay .... a Chablis from Bouchard Aine & Fils. Many of us admitted to being 90's Chardonnay drinkers who had recently been put off by the over oaked versions of this wine which flooded the market. When the Chablis bottle arrived though we all smiled and enjoyed the steely nose of the wine. We mostly felt it could be a little drier but we all enjoyed the extra portions due to the smaller than usual group. Alan's son who had worked at Wadebridge Wines. Umbrele Chardonnay comes from Romania. The name means shadow in Romanian and refers to the vineyard being in the shadow of the Carpathian Mountains. We were all impressed with the quality and flavour of the wine given that it retails at around £7 a bottle. Our thanks to Alan for an interesting afternoon, and for re-introducing some of us to the joys of Chardonnay! 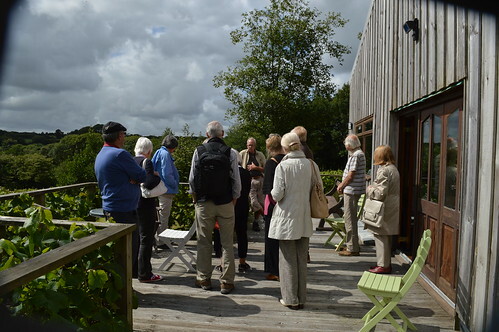 A slightly smaller group than usual (6) met at Lin & Rob Briggs cottage in Lerryn, braving the rain and mud in Piggy Lane. We tasted two wines, the first a Ca’Bolani DOC semi-sparkling Prosseco which turned out to be fairly unremarkable. This wine is available from Laithwaites. We discussed the renaming of the original Prosecco region to “Glera” (we assumed the marketing men missed this meeting! ), and the uplifting of the designation of the original DOC to DOCG. More information about these wines below. Rivesaltes Ambre wines are made predominantly from Grenache Blanc, Grenache Gris, Maccabeu and Tourbat, with a smaller amount (20%) of Muscat Blanc or Muscat of Alexandria also permitted. Subjected to a minimum of two years' oxidative ageing, they are deep golden-yellow in their youth, with aromas of sweet nuts and caramelized citrus fruits. As they age, the gold color deepens and moves towards orange, amber and eventually reddish-brown. Location: Rivesaltes is situated in the Pyrenees-Orientales (Languedoc-Roussillon region) in the south of France at 8 km from Perpignan, the department capital. (General information: Rivesaltes is 678 km from Paris). 2014 began in style for our Wine Appreciation group when we blind tasted "bubbles" at our January meeting. We started with some entertaining banter about the shape of champagne coupes. Legend has it the shape of the glass was modelled on the breast of Marie Antoinette, Joséphine de Beauharnais, Madame de Pompadour, or one of several other French aristocrats. Nowadays we prefer a champagne flute. The bowl is designed to retain champagne's signature carbonation, by reducing the surface area at the opening of the bowl. The flute has largely replaced the champagne coupe or saucer, the shape of which allowed carbonation to dissipate even more rapidly than from a standard wine glass. Our first glass was pronounced to be very palatable by the group. Quite dry, smallish bubbles, quite an apple aroma...... The second glass was much drier and only to the liking of two of the group.